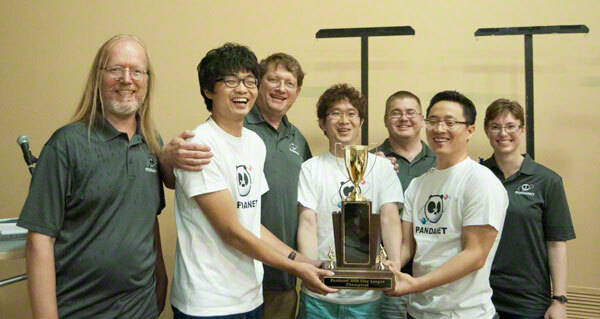 This Saturday will hold the 6th Pandanet AGA City League Finals at the US Go Congress in Williamsburg, VA. The 34th Annual US Go Congress will be the host for the live match on Saturday July 21st at 3PM in the Strong Players Room. Greater Washington will play New York City for the final match. Greater Washington has played many times in the finals so far. This will be New York City’s first challenge to the finals. The winner of the final match will win $5000 in prize money, the runner up will win $2500. Be sure to look for AGACL1-3 on Pandanet for the live matches. A tournament that began last October culminated in a 3-game showdown Saturday afternoon at the U.S. Go Congress in San Diego. The Canwa Vancouver 1 team faced Greater Washington in the finals of the Pandanet AGA City League, having topped the A League over seven rounds since October. In the end, Canwa Vancouver 1 prevailed, adding a third City League title to their wins in 2014 and 2016, and collecting the $5,000 top prize. Canwa’s Matthew Hu 1p (B, second from right) lost to Greater Washington’s Tim Song 1p (W; left) on Board 1, but Canwa’s Ryan Li 1p (B, right) defeated Eric Lui 1p (w) on Board 2 and teammate Bill Lin 7d (b) defeated Yuan Zhou 7d (w) on Board 3 to secure the win for Canwa Vancouver. Cathy Li 1p (second from left) captained the team. Watch the commentary of the game with Jennie Shen 2p and Andrew Jackson 4d from the US Go Congress. This weekend is the Pandanet AGA City League Round 6. Check the schedules for your favorite and local teams and root on your favorites. Most LIVE games will be found in the AGA City League room at 3PM EST Sunday May 20th. Updated schedules can be found using the Schedule link at the top. This weekend is the Pandanet AGA City League Round 7. Check the schedules for your favorite and local teams and root on your favorites. Most LIVE games will be found in the AGA City League room at 3PM EST Sunday June 10th. Updated schedules can be found using the Schedule link at the top. Winners will be announced after this round as well as the top two A League teams who will play for the championships in Williamsburg, VA at the US Go Congress. This weekend is the second round of the Pandanet AGA City League. Watch some of your favorite young pros and many of the strongest players in the US and Canada. Check the schedule to see your favorite team’s matchups!This Sunday LIVE at 3PM, AGA City League and AGA City League (Manual) rooms. This Sunday December 10th the Pandanet AGA City League will begin. Round 1 will take place live in the AGA City League Room at 3PM EST/12PM PST. Watch this space for schedules and updates teams will be posting soon. The Pandanet AGA City League Finals are fast approaching. It will be played on August 5th at 3pm at the US Go Congress. These matches will be broadcast on Pandanet LIVE at 3PM PST. The top board will be reviewed live on YouTube by Jennie Shen 2p and Andrew Jackson 4d. The winner of this match will receive the Pandanet AGA City League Trophy and $5000 in winnings. Greater Washington will face the defending champions Canwa Vancouver 1. Canwa Vancouver has won the trophy twice and Greater Washington has been in the finals for three years. Final round of the AGA City League is this weekend. Check the schedule at the top and find your favorite teams schedule. Tune in this Sunday at 3PM and watch LIVE in the AGA City League room. Round 6 of the AGA City League starts this Sunday. Click the schedule link up top to see who your favorite teams are playing. Catch them LIVE in the AGA City League and AGA City League (Manual) Rooms Sunday at 3PM. Round 3 of the Pandanet AGA City League will be played on the 22nd of January. Watch some of the best players the US and Canada challenge each other. AGA City League Registration begins! The fifth year of the Pandanet AGA City League is starting soon. Register your team before October 16th to ensure your team is able to play. Please make sure to read the latest rules for the tournament. Email Steve Colburn to register or re-register your team. Any questions can also be sent to this address. 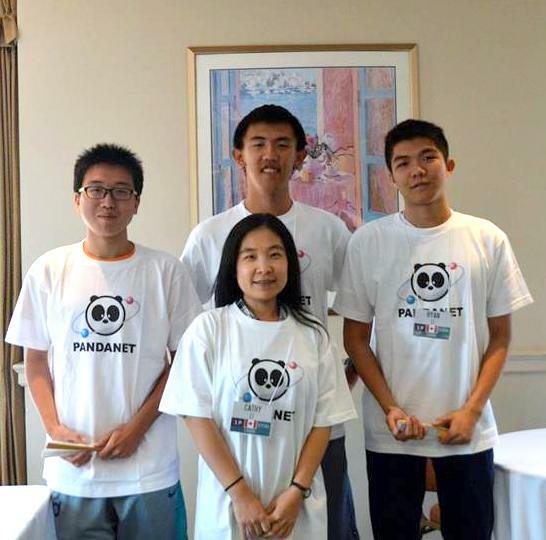 In one week the Pandanet AGA City League Finals will be played in Boston, MA a the US Go Congress. Canwa Vancouver 1 will take on Greater Washington for the championship. Canwa Vancouver won the second year of the tournament. Greater Washington has been in the finals before. All games will be broadcast on Pandanet in the AGA City League room at 3pm EST. On Saturday July 30th Greater Washington will face Canwa Vancouver 1 at the US Go Congress. They each are vying for the $5000 first place prize and a very large trophy. The game will be broadcast on the AGA Youtue Channel and reviewed by Hajin Lee 3p. Watch this space for the finals lineup. Nick Sibicky spent some time going over the seventh round match between Eric Lui 1p vs Ricky Zhao 7d. The last time they matched up against each other was the Maryland Open in 2015. Watch this exciting review below. As the third round of the Pandanet AGA City League closes out we have some leaders emerging from the packs. In League A the Greater Washington and Canwa Vancouver 1 teams have always been at the top of the leader boards. Both teams are undefeated in their league. Los Angeles, two time winners, are in third place at this point. Washington DC 2 has come out strong this year leading with three wins so far. Coming closely behind is Washington DC 1 and San Francisco 1. League C has Atlanta 2 leading with the third round. Their opponents have some catching up to do for the last four rounds. Boston 3 is close behind Atlanta 2. Watch Hajin Lee 3p review two games from the A League. This round she looked at new 1p Eric Lui’s game against Edward Kim 7d and Bill Lin’s win over AGA professional exam contender Aaron Ye. Learn why joseki is important throughout the game in this video. 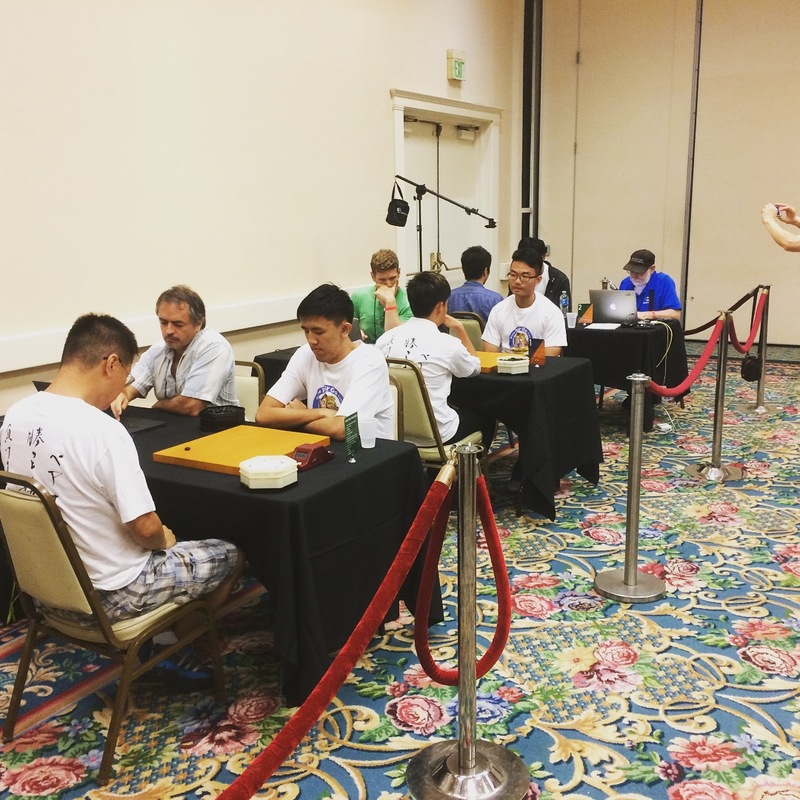 League A, League B, League C.
This January three players from the AGA City League competed in the 2015 AGA Professional Qualifying tournament in Los Angeles, CA. Of the eight players who competed Eric Lui 1p of the Greater Washington team is the newest AGA professional. Aaron Ye (Bay Area) and Jeremy Chiu (San Francisco 1) also competed. Aaron Ye gave Eric Lui a large challenge for the final matches of the tournament. Other professionals who play in the AGA City League are Ryan Li 1p (2014 AGA Professional, Canwa Vancouver 1), Tim Song 1p (Greater Washington), and Huiren Yang 1p (Boston). As the second round of the Pandanet AGA City League concludes, A few contenders start to appear in the field. Two teams in each league have won their first two rounds; League A: Greater Washington and Canwa Vancouver 1, League B: Washington DC 1 and 2, League C: Boston 3 and Atlanta 2. The next round will be January 24th. This month bring us a review by Nick Sibicky. He talks about “Seattle’s Secret Weapon” in the A League in his first two games of the season. Sibicky adds that “teams are the way to go” when watching go as a spectator. This Sunday starts another exciting round of games for the Pandanet-AGA City League. Check the schedule to see who your favorite team is playing. Will Canwa Vancouver, Washington DC 1, and Atlanta 2 keep their leads? We’ll see after this round! Two weeks ago the Pandanet AGA City League started. One of the changes this year is the addition of video commentary for the rounds. In the first round xhu98 goes over some of the C League matches. The games were reviewed live on twitch and later posted to youtube. Click below to watch two hours of reviews from these matches. In two weeks Nick Sibicky or Andrew Jackson will cover the next round. This Sunday October 18th starts the fourth year of the Pandanet AGA City League. Make sure to follow your local and favorite teams throughout the year. We’ve already had one game early this week and was exciting to start off the year. For those who have followed in the past we have expanded the leagues and there are now eight teams for the A and B leagues. Also starting this year is video reviews from some online commentators like Hajin Lee and Andrew Jackson. The first round will be done by Xiaocheng-Stephen Hu/xhu98. Worries you’re going to miss football while watching the games? Download the Android and iOS app for Pandanet. Look in the AGA City League and AGA City League (Manual) rooms. The new season for the Pandanet AGA City League begins! Start gathering your team for the fourth season of this exciting league. With some revised rules to make the seasons longer and more challenging games. We’re expanding the teams to eight teams per league for the A and B leagues. Check the rules for a special registration deal for the teams. Does your team have what it takes to defeat our winners from last year? Registration is open until September 20th. Email steve.colburn@usgo.org for more information or to register your team. The winner of this tournament will be $5000, runner up will be $2500. Look out soon for news for the next year’s City League registration! The Pandanet AGA City League has come down to one more match. At the US Go Congress in St Paul, MN, Los Angeles will face off against Greater Washington. 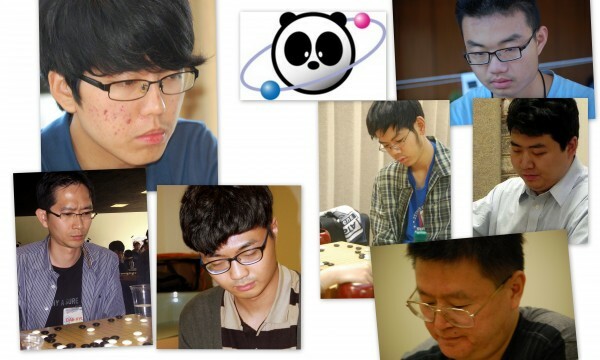 Playing for the Los Angeles team (left) will be Mark Lee, Evan Cho, and Daniel Ko. Playing for Greater Washington (right) will be Tim Song, Eric Lui, Yuan Zhou, and Jie Li. These players will face off on Saturday August 1st. Come watch live in person or on Pandanet-IGS. Make sure to watch LIVE games on Pandanet on Sunday April 26th in the AGA City League and AGA City League (Manual) rooms. Check out the latest client from Pandanet. Away from your computer when the games are going on? Download the Pandanet (Go) app for Android and iOS! Pandanet City League has been going strong for four rounds now. With a couple more games and one more round to go, at least one league is cutting the top positions close. The A League has Greater Washington and Boston in the lead with 6 points each. As they faced off this past round GW got the better of Boston but theyre holding on from previous wins. Hot on their tails is LA and Seattle 1. LA still has one game left to play and they will most likely be in playoff contention. The B and C Leagues have pull away leaders in Princeton and Berkeley. Both teams are new this year with strong players behind them. They lead their leagues with 8 points each. The next team is currently at 4 points each. LA currently leading with 6 points. Greater Washington and Boston just behind them with 4 points each. Princeton Leading with 6 points, Bay Area trailing with 4 points. Games still ongoing. Berkley leads with 6 points. DC Team 3 in second place with 4 points. The third round of the Pandanet-AGA City League is this Sunday. Watch the action live starting at 3pm ET/12pm PT. The games are heating up between all of the teams. The schedules for A League, B League, and C League can be found on the Pandanet site. Pandanet City League this Sunday! This Sunday is the second round of the Pandanet-AGA City League. Watch heavyweights from the A League including professionals like Ximeng Yu and AGA’s newest Ryan Li. Don’t discount our B and C Leagues. They will be duking it out with the other teams. Check the schedule at the top for your local team. Most of the games for the first round have been played already and they were spectacular. With many of the strong AGA and CGA players playing we have seen some exciting games. The new season of the Pandanet-AGA City League starts on Sunday November 23rd. Check our schedule to see the matchups for this round. Make sure to logon and root for your local team! The Canwa Vancouver 1 team defeated Seattle 1 at the Pandanet-AGA City League finals on Saturday afternoon at the US Go Congress. As Congress attendees registered and caught up with old friends, the Vancouver and Seattle teams faced off in the top-board playing room looking out onto the nearby Empire State Building in midtown Manhattan. 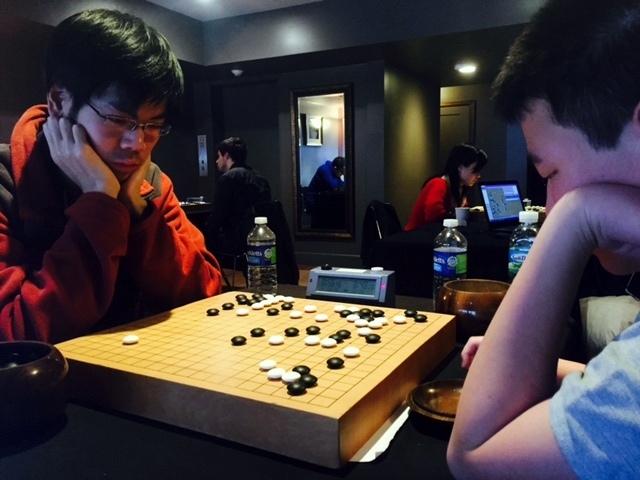 Bill Lin 7d of Vancouver defeated Ximeng (Simon) Yu 1p of Seattle on Board 1 (photo), while on Board 2, Ho Son 7d from Seattle evened the score by defeating Juyong Koh 7d of Vancouver. On Board 3, Ryan Li 7d bested Seattle’s Momoko Tsutsui 6d to win the event for Vancouver. ”Congratulations to Canwa Vancouver 1 for their hard-fought victory in the finals and for an impressive performance throughout the year,” said Tournament Director Steve Colburn. All three games were broadcast live on Pandanet-IGS and have been posted on the City League website. The final round is to be played at the US Go Congress (www.gocongress.org) in New York City. The round will be played the first Saturday August 9th at 3PM. Games will be played in Penn Top, the same room that the top boards will be played. Watch for the LIVE simulcast in the AGA City League room on Pandanet-IGS. Congratulations to the C League teams. On Saturday August 9th Seattle 1 will play Canwa Vancouver 1 in the finals at the US Go Congress in New York City. Play is still ongoing, currently Katy TX 1 is leading with an undefeated score. They are followed by Canwa Vancouver 2, Katy TX 2, and Brentwood/Nashville. Round 6 will be played on Saturday June 17th. Canwa Vancouver 1 will play Seattle 1 at the US Go Congress in New York City. They will play on Saturday August 9th. We will announce the time soon and post it here and in the AGA E-Journal. AGA City League Round 5 - FINALS! Round 5 for the AGA City League plays on Mat 17th. As always catch the action live on game day at 3PM EST on Pandanet using the new GoPanda2 software. Games will be played in the AGA City League room. After four rounds Canwa Vancouver 1 is leading the A League. Hot on their heels are Seattle 1 and Greater Washington with one match behind. May’s final matches will decide which two teams will meet at the Pandanet City League Finals in New York City at the US Go Congress. New York City is leading Chicago by one board point in League B. As they have already played each other they will be neck in neck in the final round of play. The teams in the C League were closer matched before this round. Now Katy TX 1 has come way out ahead in their matches. Katy TX 2 and Memphis are in the 2-3 seed respectively. With three more rounds to go the lineup could change a lot before the end. Round 4 for the AGA City League plays on April 26th. Round 3 for the AGA City League plays on March 29th. Round 2 for the AGA City League plays on February 22nd. The first round concluded last night with a win by Katy TX 1 defeating Syracuse to complete the round. Our selected game for this round is from the B League. Changlong Wu 7d (Tallis) of NC Raleigh defeated Aaron Ye 5d (G0dnPoppy) of San Francisco played a very interesting game. They both went all out in their match. The game will keep you on your seat till the end. The first round of play has mostly completed for the AGA City League. The new series of games will restart shortly. We have 18 teams of players ranging from professionals to 12kyu players in our midst. Leagues A & B will have five rounds and League C will have seven. The game schedule will be once per month as the schedule says. The first round will start on January 25 at 3PM EST, 12PM PST. The second year of the Pandanet-AGA City League Kicks off this weekend on IGS. Play will start for all of the leagues at 3pm on Saturday the 26th. We have 17 teams for this season and play should be very exciting. Watch some of the best players in the country vie off against each other. Play will take place in the AGA City League Room. You will see more information as it is updated on this Pandanet site. 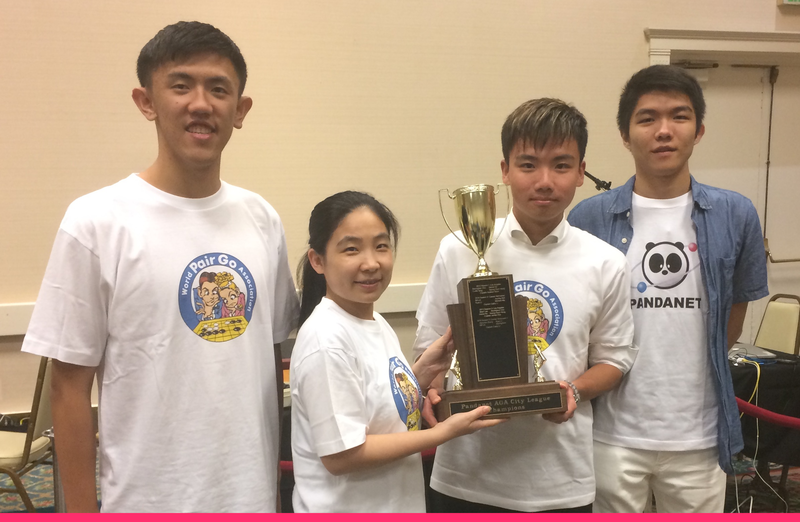 Team Los Angeles won the Pandanet-AGA City League A-League finals Saturday at the U.S. Congress in Tacoma, WA, defeating the Washington team 2-1 in hard-fought games. Beumgeon (Evan) Cho defeated Jie Li on Board 1, while Seung Hyun (Kevin) Hong beat Yuan Zhou on Board 3 in the afternoon games, broadcast live on Pandanet. Eric Lui, playing via Pandanet from Seoul Korea, where he’s playing in the Samsung Cup preliminaries for the AGA, scored DC’s only win by defeating Dae Hyuk (Daniel) Ko. Andy Okun captained the LA team. “We’re tremendously pleased with the results of our first year of the Pandanet AGA City League,” League Project Co-Manager Jon Boley reported to Congress attendees Saturday night at a brief awards ceremony. Twenty eight teams competed in four leagues: LA won the A League, Toronto won the B League, Chicago won in C League, and Brentwood, TN won the D League. Photos of the final round that took place in Tacoma on August 3rd, 2013. Watch the finals for the City League on July 28th starting at 1PM EST for the finals for these leagues. They will play their games then. Watch for more information about the broadcast of the LIVE A league finals at the Us Go Congress. The 10th, and for most teams, final round is scheduled for this Sunday, July 14 on Pandanet IGS. At the conclusion of this round, the top two teams in the A League will be invited to play one final playoff round to take place in person at the 2013 US Go Congress on Saturday afternoon, August 2. Watch all four leagues starting at 1PM EST for the City League. C & D Leagues will play at 1PM and the A & B Leagues will start at 2PM. Be sure to root for your local team. The Pandanet-AGA City Leagues A & B will play round 8 on Sunday June 16th. For the A League Greater Washington is just edging out the team from Los Angeles by one board point. Both teams have 8 points all together and records of 4-2. Los Angeles will play New York City, Greater Washington will play Boston, and Seattle will play Vancouver. With the field so strong in the league at this point Boston could come out and challenge LA and GW for the top slot. . In the B League Toronto has come out with a strong record and is leading the league with San Francisco hot on their tails. Toronto has 10 points and a record of 5-1 and San Francisco with 8 points and a record of 4-2. Southern California will take on the leading San Francisco in a tough matchup. Massachusetts will play Washington DC and Toronto will play Montreal. It will be exciting to see if Toronto will gain another win to stay on top of the standings or will there be a tight playoff the last two rounds to see who the winner is. Rounds will be played on IGS at 2PM on June 16th. As always the most up to date standings are found on the to your right. This Sunday the Pandanet/AGA City League plays Round 7 for the A & B Leagues and Round 5 for the C & D Leagues. Watch LIVE on IGS starting at 1PM EST/10AM PST on Sunday March 26th. A and B Leagues Round 6 today! A and B Leagues play round 6 today at 2PM EST today. Tune in to watch these exciting matches. Pandanet AGA City League rounds 4 and 5 will be played this Sunday, April 28. Leagues A and B will play their Round 5 games at 2p EST, while Leagues C and D will play their round 4 games starting at 1p EST. Find the pairings on the Pandanet schedule page. Watch for all of the leagues to play this weekend with rounds starting at 1PM and 3PM. We hope to see you there. The A & B Leagues played on March 17th. Results have been posted on the round pages. All Leagues will play again on March 31st. Watch the rounds LIVE starting at 1PM EST in two weeks. The second round of the Pandanet AGA City League will be held this Sunday, February 24. Round 1 winners in the A League were Greater Washington (d. Boston), Los Angeles (d. New York City) and Vancouver (d. Seattle). In B League, winners were Washington DC 1, San Francisco and Toronto. In the C League, winners were Washington DC 2, Memphis, Chicago and Pittsburgh. D League winners were Quebec, Southern California 2, Kentucky and Brentwood TN. Starting this Sunday January 27th the first round of the Pandanet-AGA City League begins. Tune in on IGS using the new GoPanda2 client and watch the opening round. We have posted round and game information on the right nav bar to help you keep track of your local and favorite teams. Registration has closed for the 2013 season. We have had great response with 28 teams registering. We are in the process of splitting the teams into the appropriate league and setting things up. We will be contacting teams shortly for more information. We are all excited for the games to begin! Registration is now open for the inaugural season the Pandanet-AGA City League. Fully sponsored and funded by Pandanet, this new online tournament will provide players an opportunity for regional competition. “This is an exciting new opportunity to develop our go community here in the US,” says AGA President Andy Okun. “Thanks to Pandanet for a great competition that will build up the US go community in new ways.” Teams will consist of four players, three of which will play in each round on a rotating basis, and a non-playing team captain. Each team will represent a city or a region. The tournament format will be double round robin, with 10 rounds each season. The top six teams will make up an “A” League and will play a double round-robin with each other throughout the year on the International Go Server (IGS). A final round between the top two teams in the A League will be played at the US Go Congress. Other teams will be placed into a “B” League and possibly a third, “C” League. The top finisher in the B League moves up to the A League after each season, replacing the bottom A League team. Registration for Season 1 closes December 20, 2012 and the first season will begin January 1st on an accelerated schedule, with all following seasons beginning September 1st of each year. 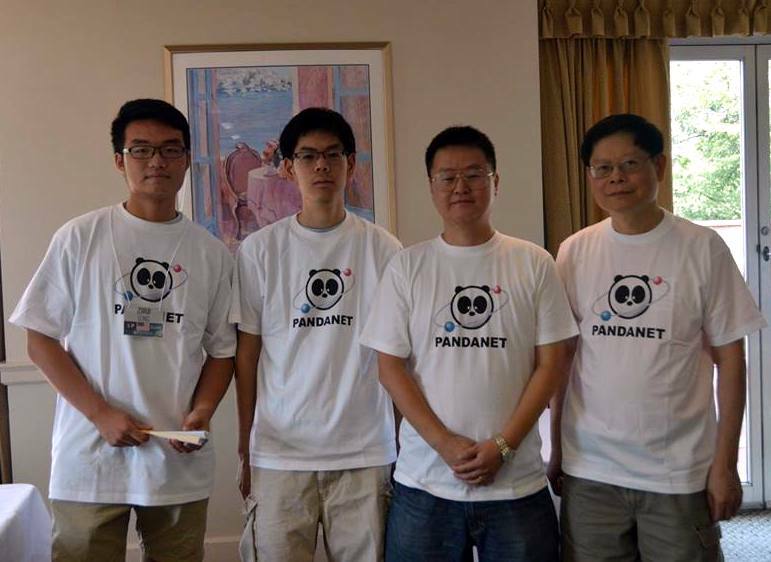 In addition to generous cash prizes provided by Pandanet, teams are encouraged to seek their own local sponsors to provide the team with travel, training, game-fees, celebration and community events. “Teams of all strengths are welcomed and encouraged to register!” says tournament director Jon Boley.